Manolo Blahnik strappy patent leather sandal. 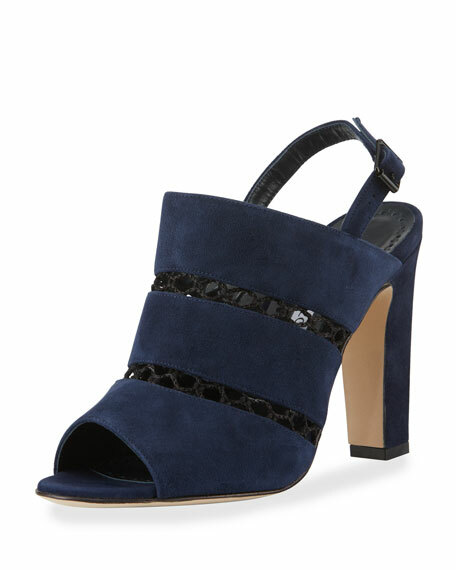 Manolo Blahnik suede sandal with net trim. 4" covered block heel. Open toe. Adjustable halter strap. Smooth outsole. "Aspendum" is made in Italy. Exclusively ours. (White floral only) Manolo Blahnik fabric and clear vinyl sandal. 4.3" covered heel. PVC strap bands open toe. Self-tie ankle wrap strap. Smooth outsole. "Estro" is made in Italy. Exclusively ours. (Lime Snake and Gold Snake Only) Manolo Blahnik sandal, simply styled in exotic Elaphe watersnake. 2.8" covered heel. Strap bands open toe. Slide style. Leather lining and sole. Made in Italy. Manolo Blahnik suede sandal with clear PVC straps. 3.5" covered block heel. Open toe. Adjustable slingback strap. Leather lined. Smooth outsole. "Khan" is made in Italy.